There are a number of ATE initiatives, like ATE Central, which support the rest of the ATE community. These projects and centers create materials for recruitment and professional development, disseminate research results, assist in evaluation, and generally spread the word about the impacts, resources and innovations within ATE. This web site and print booklet enhance awareness and catalyze partnerships for the National Science Foundation ATE centers and program. Information about the ATE program and each individual center can be found on the site, and materials can be downloaded, including an ATE Centers logo, poster, and the full PDF version of the booklet. 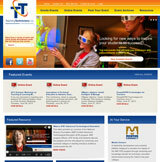 ATETV creates weekly videos designed to connect students and professionals to careers in advanced technology. The project also aims to share success stories from students and ATE programs across the country. Each week, a new video highlights such topics as a growing technical field or career, a unique ATE program, a student or technician working in advanced technology, and much more. EvaluATE is the evaluation support center for the National Science Foundation’s Advanced Technological Education program. EvaluATE provides webinars, resource materials, newsletters, workshops, and opportunities for ATE community members to engage around issues related to evaluation in the pursuit of excellence in technical education. The Mentor-Connect project, spearheaded by South Carolina Advanced Technical Education (SC ATE), provides support for leadership development and knowledge transfer by developing and supporting potential, current, and former ATE grantees. The Mentor-Connect website provides an extensive library of materials related to ATE proposal preparation and grants management. 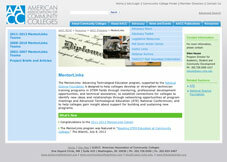 The MentorLinks program, from the American Association of Community Colleges (AACC), sponsors national grant competitions which pair community colleges seeking guidance in developing or strengthening technician education programs with experienced mentors in the field. Through professional development opportunities and technical assistance, MentorLinks impacts numerous fields, from biotechnology to renewable energy. This project, led by the South Carolina Advanced Technical Education (SC ATE) National Resource Center for Engineering Technology, impacts technical education by providing "state-of-the-art, faculty development in advanced & emerging technologies, teaching methods, science, technology, engineering, and mathematics (STEM)." The site provides links to online and onsite events, and boasts an impressive archive of previous events with files, links, and contact information.